My last blog post was about the Woulfe family of Listowel and Athea where the records are very scanty. Now, we approach a period of greater certainty. The first certainty is that the surname Dillane was very common around Athea, Glin and Newcastle in the early 1800s. Very, very common. They used the first names Edmond, John, Mary and Bridget over and over. I don’t really know where the family came from. I’m guessing they slowly headed west from Fedamore, where there seems to be a greater concentration, but it may just seem this way because the records were better kept. The Tithe Applotment Books for 1826 show Dillanes all over the place. The name is spelled Dillane and Delane at different times, but never Dillon – it took the English convict administration to bring about that change. What we do know is that not long after 1810, a Mr and Mrs Dillane were living in Athea, West Limerick. There were other Dillane children of the same first names born there who were not siblings but seem likely to be relatives, so we can deduce that Mr Dillane had family in the area, probably brothers and sisters, and that he either moved there when young or was also born there. What was Mr Dillane’s first name? That’s the million dollar question. Most likely it was John or Edmond. 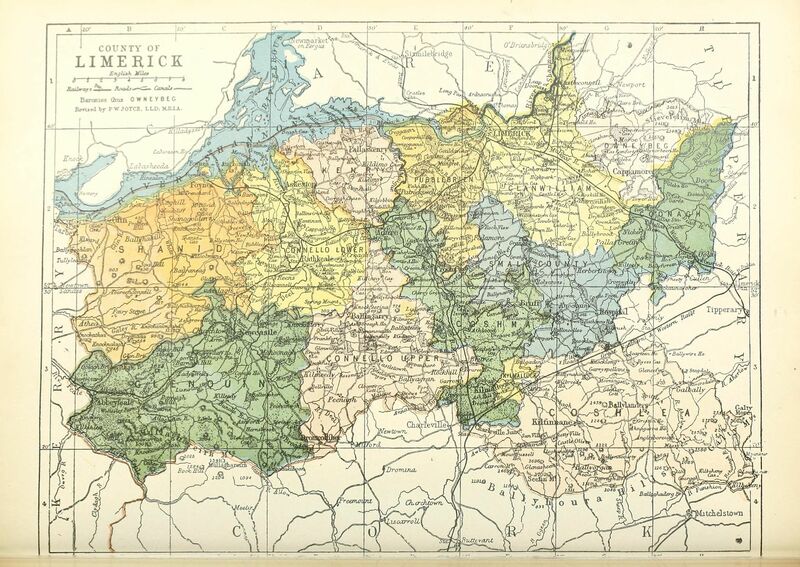 Here is a map of Limerick in Ireland. The district/village of Athea is in the yellow bit on the far left, very close to the Kerry border. 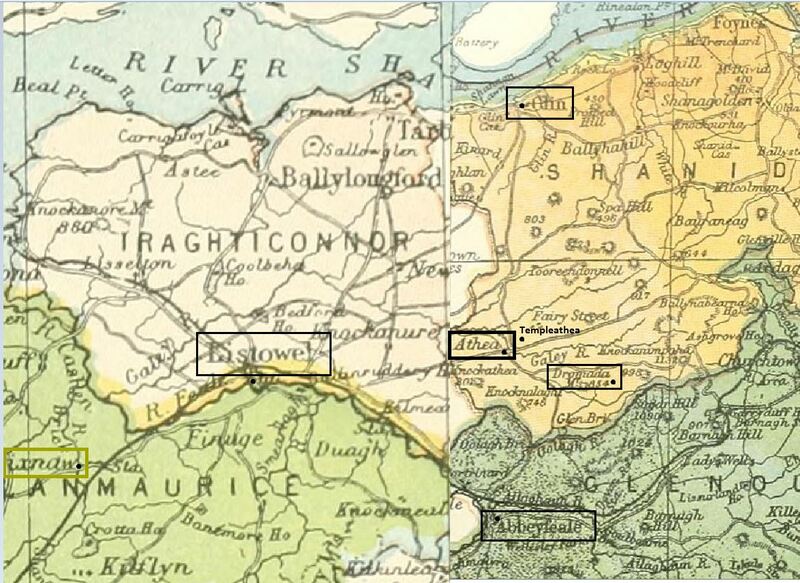 The Woulfe family – and probably the Dillane family too – lived on both sides of this border, around Athea and in a reasonably sized town called Listowel in Kerry. The records for Kerry are not available via Rootsireland yet. 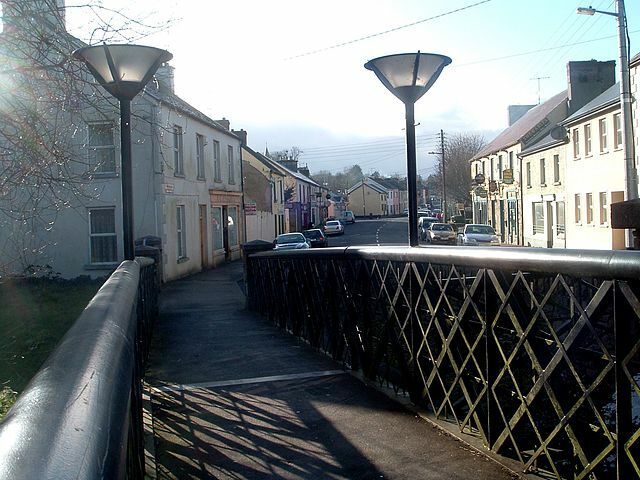 Listowel and Athea are 13km (8 miles) apart, an easy walk for those used to walking. Templeathea is about a mile and a half from Athea to the east, nowadays the two villages have grown together. 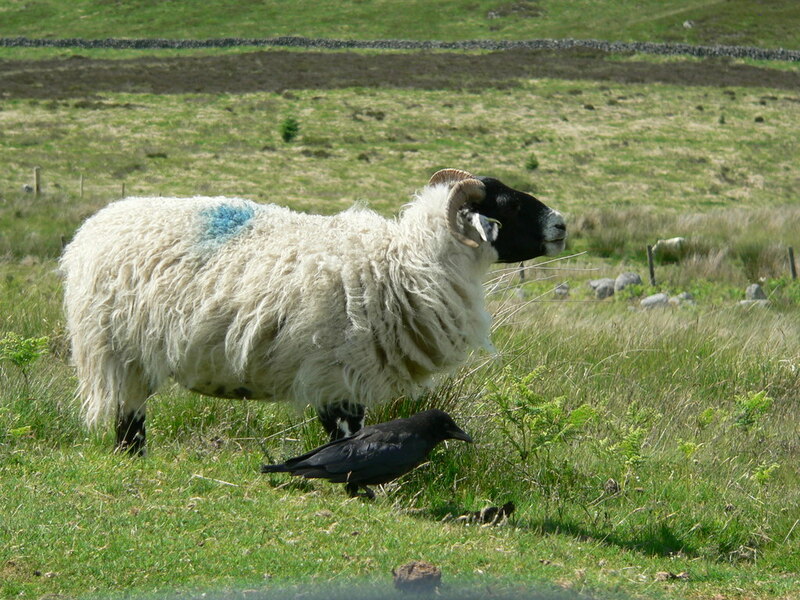 Drumadda (Dromadda) is about five miles from Athea to the south east. Abbeyfeale was the nearest big town and is about seven miles south of Athea. This was the home territory of the Dillane and Woulfe families. I put together a map of their territory out of public domain maps. It’s a quick effort but scaled correctly for roads and the river. Being different maps, the town names are a different font size and not fully indicative of town size. I have put squares around the regions relevant to my ancestors. I have included Lixnaw and Glin as my father has several DNA matches who have ancestors there. I don’t know the connection but I think there is one. Back in the early 1800s, this part of Ireland was a rough place. It was the time of the Terry Alts and the White Boys and other secret societies that committed savage and inhuman crimes in Ireland in the name of freeing the underdogs from suppression. As well as the societies, there were desperate poor people, starvation, crime and suspicion. Irish Catholics were evicted from their home, often by their own Irish family members who were soldiers in the British military and never imagined their employment would bring them to this. Women were raped, men on the Tipperary/Limerick border had their tongues cut out and their ears cut off, and the atrocities committed to sheep and cattle were at times too horrendous to mention. Some nasty things happened in Ireland in the 1830s and 1840s. Amongst the horrors, life went on as usual with men and women marrying and raising families. The Woulfe family had farms. In the 1833 Tithe Applotment Records, now digitized at the National Archives of Ireland, Maurice Woulfe can be found living in Dromadda in the parish of Rathronan. Also in the Tithe Applotment records, one John Dillane can be found living in Lower Athea, also in the parish of Rathronan. Without having any way of proving or disproving this, I am reasonably sure that these two men are my ancestors, but that particular John Dillane could as easily be Edmond’s brother rather than his father. On 9th February 1834, the year following the Tithe Applotment list, my ancestor Edmond Dillane married Maria Woulfe in Athea, Limerick. Each of them was Roman Catholic. Their parent’s names were not given but the witnesses were Maurice Woulfe and Hannah Woulfe. Edmond was aged about 20, and Maria’s age we don’t know but she was probably of similar age. This is where another uncertainty enters the story. Edmond Dillane, my ancestor, was a convict who was transported to Australia for burning down a haystack. The family story has it that the haystack belonged to his father in law. This story is rather old in our family, my grandfather knew it long before overseas records were available, in fact long before convict records were easy to get. My grandfather was not a genealogist, most of the stories he heard from his grandmother Mary Theresa Dillon, who was a somewhat formidable lady who seems to have made an impression on everyone. She was born in Australia to Irish parents, so my grandfather did not hear it first hand. His grandmother was a granddaughter of Edmond Dillane and Mary/Maria Woulfe. This sort of setup did happen, and I have some ancestors (John and Alice McKinley of Fermanagh) who I am pretty sure did exactly this. But not the Dillane boys. As more evidence comes to light, it doesn’t look that amicable and our Dillanes were far from blameless. Not only this, but we now know there were at least two farmers called Maurice Woulfe in Dromadda. One of them was father of some emigrants to Iowa, and he appears to have died before 1838. The other was the one our family knows so well. Both are listed in the 1833 Tithe Applotment records. Probably, one of the two Maurices were Maria’s father but each of them were about the same age, and each had a daughter named Mary or Maria. We have no real proof that her father’s name was Maurice at all. She does not appear to have a son called Maurice, so perhaps the whole Maurice thing is incorrect. Nonetheless, she was a Woulfe and she does indeed have a grandson named Maurice. So perhaps the issue was something else, and perhaps the haystack was not Edmond’s father-in-law’s but a different Maurice Woulfe’s. With that caveat we can now examine the facts. William Roche, for burglary and abduction of Mary Woulfe at Dromadda – Death. There’s a story here for sure, but I have no idea what it is. It would not surprise me to learn that this is my own Mary, because something must have brought her to marriage with someone who it seems was very different to herself. There was a review on Ireland, undertaken by British parliament in the 1830s, which covered abductions of females in Ireland. It was apparently – supposedly – a common means by which a young man could secure a girl to be his wife, if her parents refused their permission for the marriage. He would abduct her and keep her overnight, and in the morning a marriage was the only way to redeem her from shame, even if nothing had occurred between them through the night. A priest from Clare was interviewed in that enquiry and stated that he had himself performed marriage ceremonies for some of these abducted girls and their abductors. The ‘Selections of Reports and Papers to the House of Commons’ in its various volumes through Google Books are a truly fascinating read if you want to know about early 19th century Ireland. So seven years after a Mary Woulfe was abducted and presumably recovered, my Maria Woulfe was married in Athea and hereafter known as Mary not Maria. We are now through the uncertainties and can proceed using available records. But the post is getting long so I’ll continue in the next. My name is Garry Gleeson. I am a descendant of one of the 3 Dillane Brothers ( John) who was sent to Tasmania as a convict. He was my Father’s Great Grandfather. The story of them burning down the father in laws haystack is definitely authentic. I have a copy of the newspaper report of their trial somewhere on my iPad. My email is old@iprimus.com.au if you would like to contact me about sending it to you. Our Dillanes are very likely to be connected. The trick is finding out the precise link but it just might be achievable with more records becoming available all the time. I notice you still have the original spelling whereas ours morphed.